I make no attempt to hide the fact that I'm a pretty huge fan of the current IDW Transformers comic series, More Than Meets The Eye, and when Hasbro announced the latest series of Generations toys was going to cover several of the IDW characters, I was ecstatic. Sure at first we didn't get a lot of the major cast members of that particular comic series, but we did get some members of the Lost Light crew such as Trailcutter (Previously known as Trailbreaker) and Hoist. 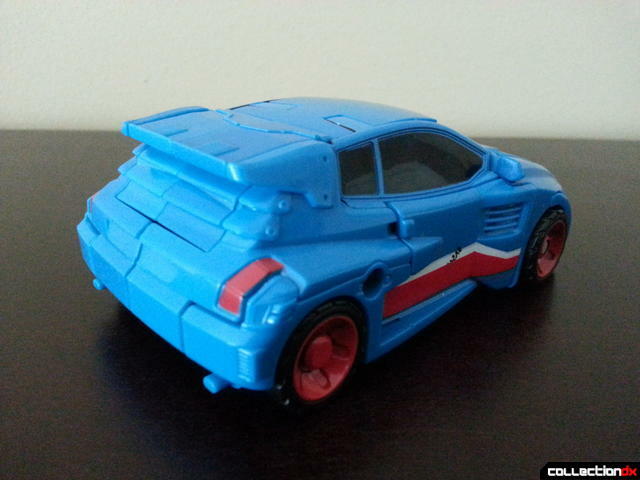 But the real excitement came from when we heard about more characters coming, such as Swerve, Tailgate, and the toy in question: Skids. Skids showed up at the beginning of MTMTE as an Autobot with amnesia being chased by a group of giant mindless robots known only as the Legislators. 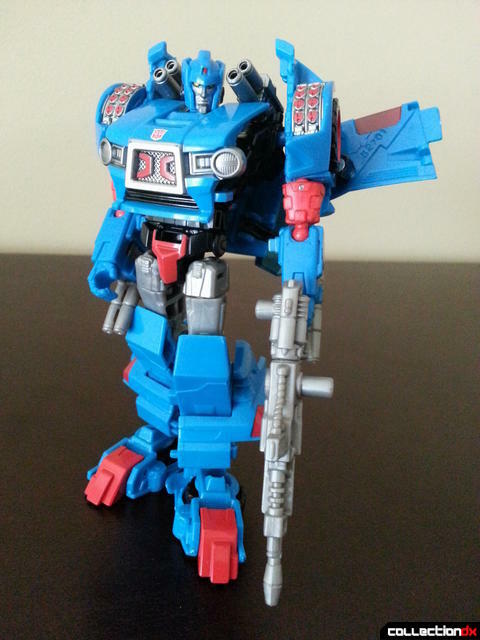 With no memory of who he is, or the fact that he is absolutely covered with weapons, he joins the Lost Light crew on their quest for the Knights of Cybertron. 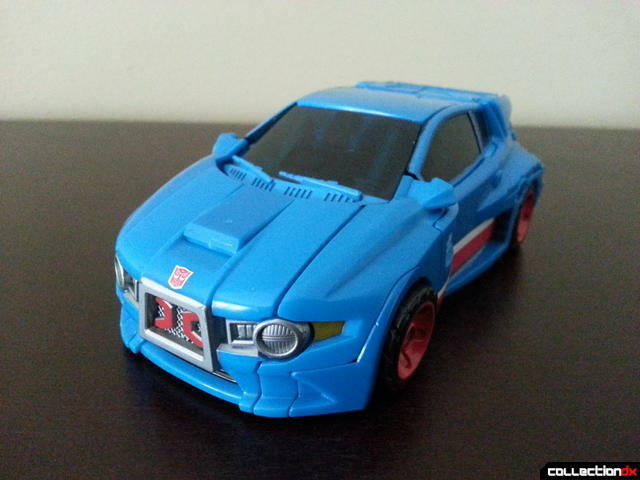 Skids' altmode is a compact little car that bares a striking resemblance to the Prime Rumble toy. It's purely coincidental though, and this one is way nicer in my opinion. The grill in particular has some really well sculpted and painted detail. Mine has a bit of an odd paint control problem in that the right door has a bit of the serial number that should be painted on the INSIDE of the door on the outisde. Quirky enough to make me not care at all. 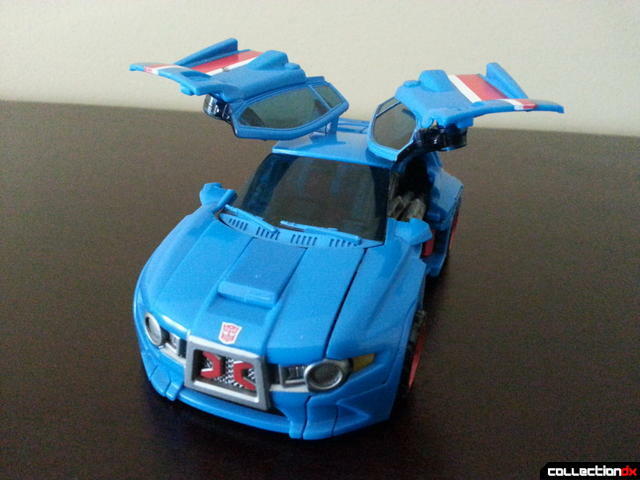 A pretty universal thing across most Skids is that the plastic used between some parts of the toy are slightly different shades. It's not distracting if you look at it from afar, but staring at it will make it pretty obvious. 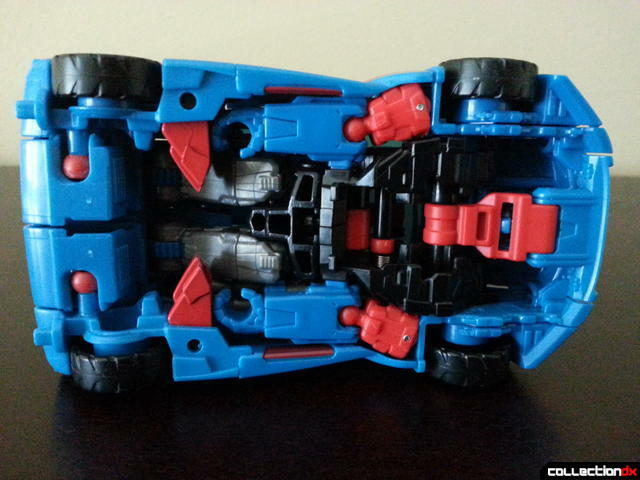 A quick peak underneath shows that this guy is pretty well compacted and stuffed with transforming goodness. 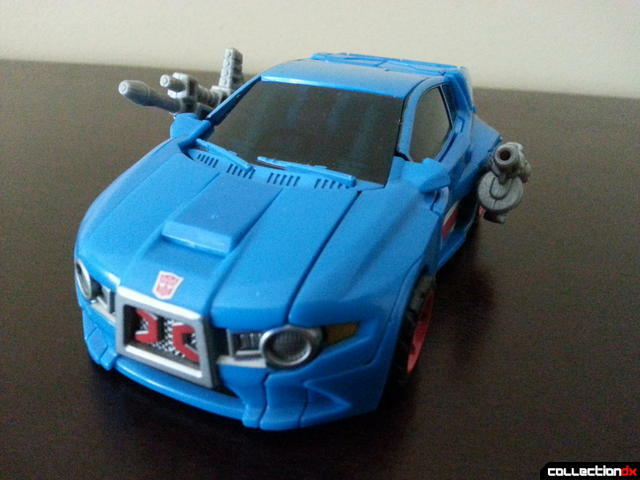 You can also peg his two weapons into either side of his car via two 5mm peg holes. 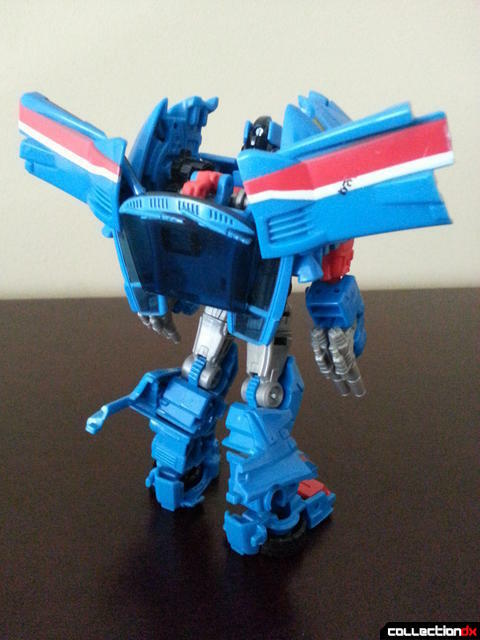 I really enjoy Skids' transformation, which involves unraveling his legs and revealing his head. 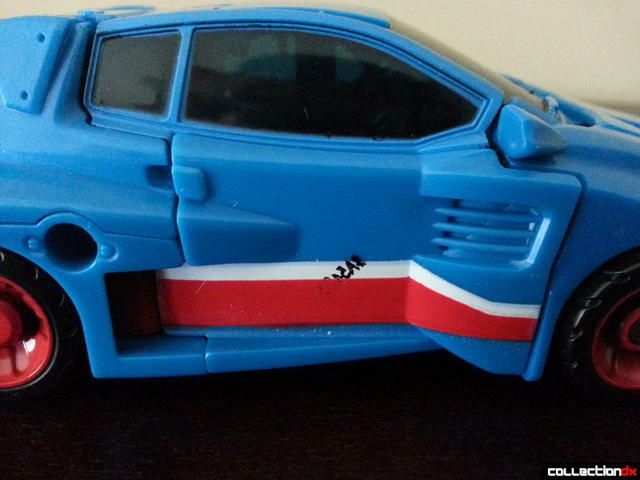 It's a pretty standard transformation, reminiscent of both the classics Jazz and Prowl mold, with a few unique twists to make him stand out on his own. 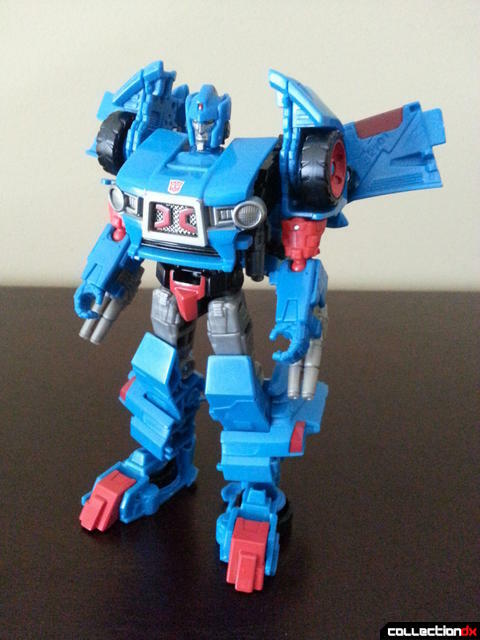 In robot mode, Skids is a very handsome looking robot. With a very slender yet bulky body and a chin that would put Jay Leno to shame. He does have a bit of a backpack, but considering what it does, I don't particularly mind in this case. 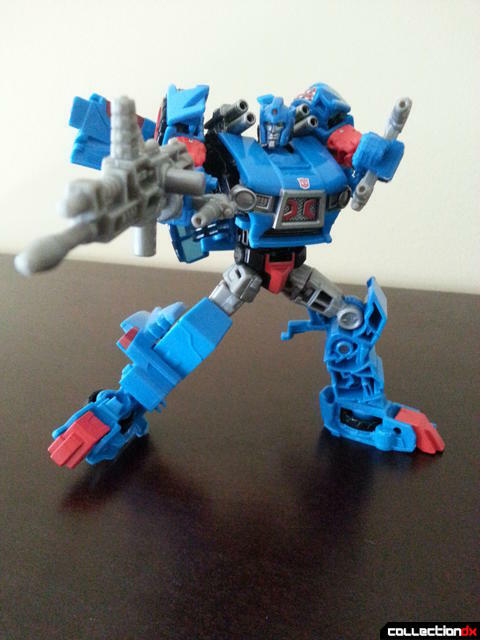 I'm a pretty big fan of Skids' articulation, though it isn't perfect. His shoulders are balljointed though it's limited due to the size of his shoulders. Still there is an effective range for most poses that you would want to accomplish. His head is balljointed and incredibly emotive with plenty of tilt and range in all directions. The arms are balljointed as well with no wrist articulation. His legs are what really impress me. He has a waist swivel, ball jointed hips with a thigh swivel, technically double jointed knees because of his transformation, ball jointed ankles and even a slight bit of toe articulation due to transformation. 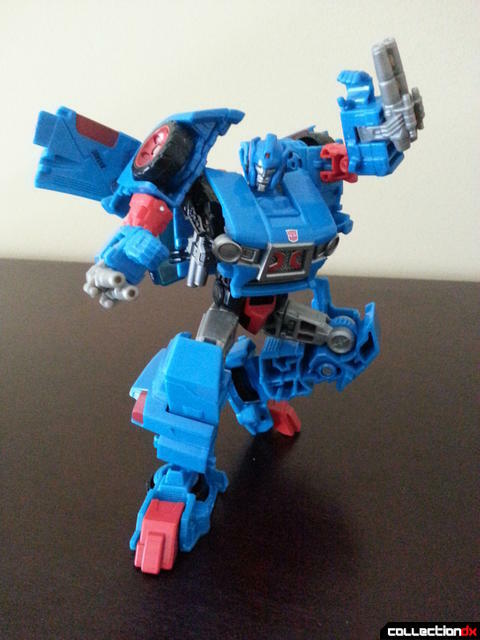 Between all of that, Skids can pull of most poses you would want. 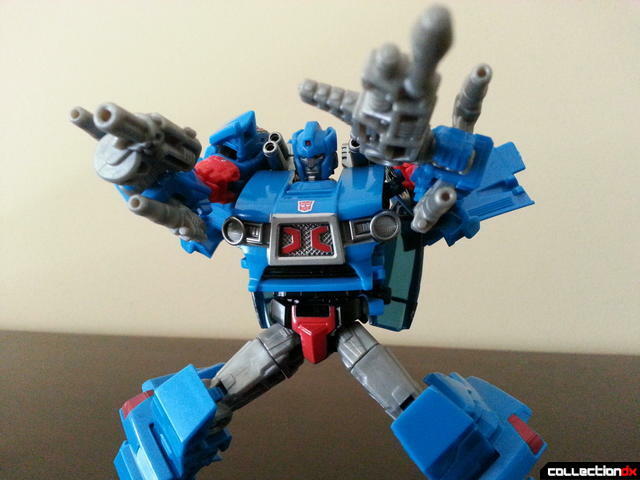 Skids comes with two guns: one reminiscent of his G1 gun and another smaller gun which can be considered to be one he uses in the comic. These two can combine into a bigger rifle. 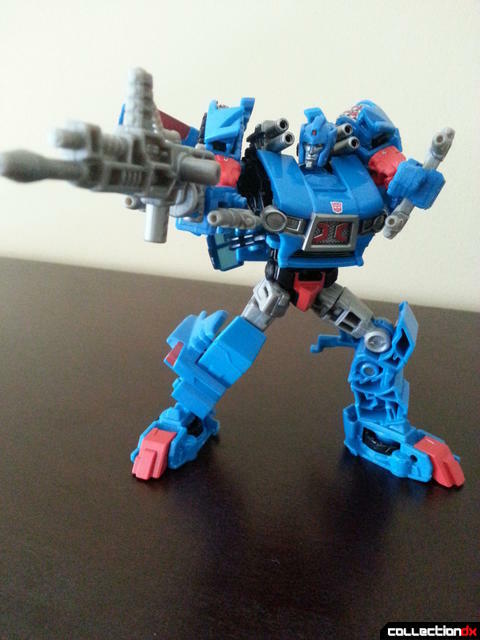 As I mentioned earlier, Skids has a load of weapons in the comic and this toy has them too. 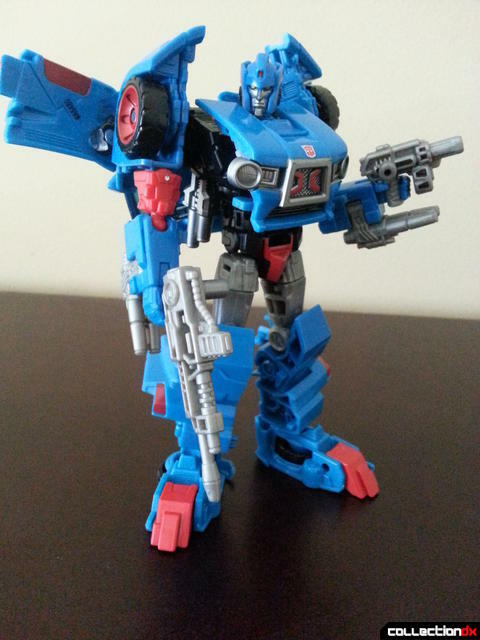 He has a set of shoulder mounted cannons that are spring loaded and can be pulled out by repositioning his backpack, along with hidden missile launchers in his shoulders and flip out guns on his forearms. 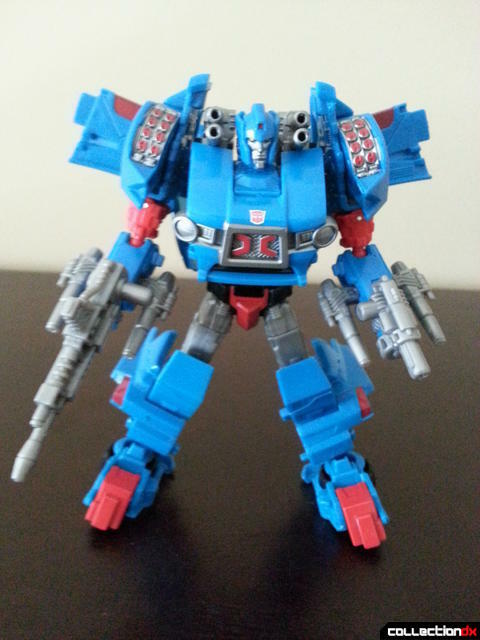 Between all of that, Skids is one seriously decked out and ferocious fighter. 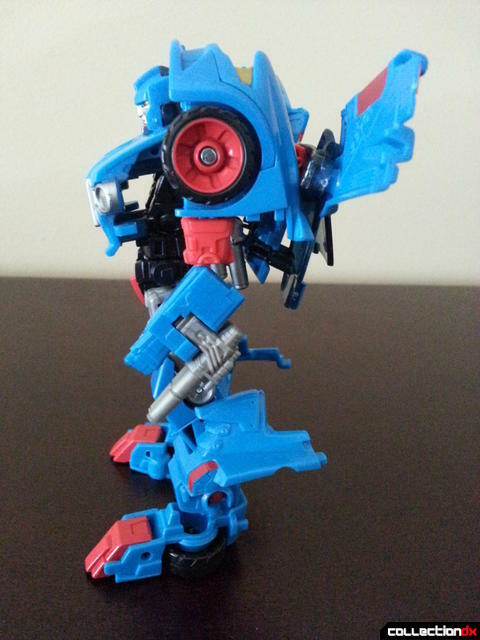 Now I mentioned earlier that Skids does have balljointed ankles, but at first glance they may not seem very useful because the balljoint is facing the outside of his legs, making it very difficult to use. However, there is plenty of range and play in the ball joint so if you just force it out of the socket, you can still used it as an effective ankle tilt. 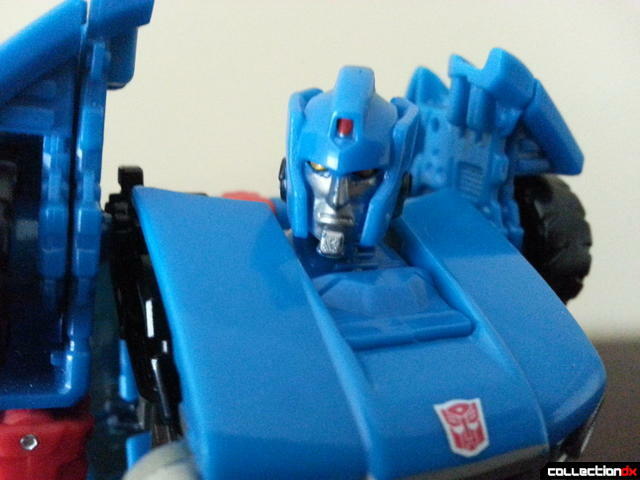 In addition to all of this, Skids also comes with an issue of the comic which is issue 22 of MTMTE. It's the final issue of what is considered season 1 and a very fun read, though I think it may confuse some people who haven't read any of previous issues. Still, a free $4 comic goes a long way to make this a better value. I'm not gonna lie, with heavy biases, I love this toy. 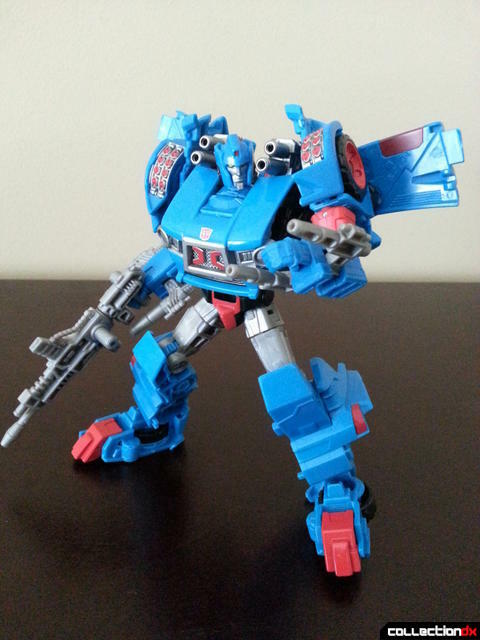 Skids has quickly become my favorite Deluxe Transformer this year. I feel some people may be overhyped on him, or dislike his shoulder joint design, but he is a fantastic representation of Alex Milne's character design and happily makes me one step closer to owning my own Lost Light crew. I have had this figure for almost two weeks and not once transformed him, he is just that awesome! Great review, Great figure, great comic! It is impossible to understate how awesome Roberts' writing is with Milne's art. Transformers aside it is a plain brilliant comic, really this guy has put WAY too much thought into robots. Empurata @&$) me. 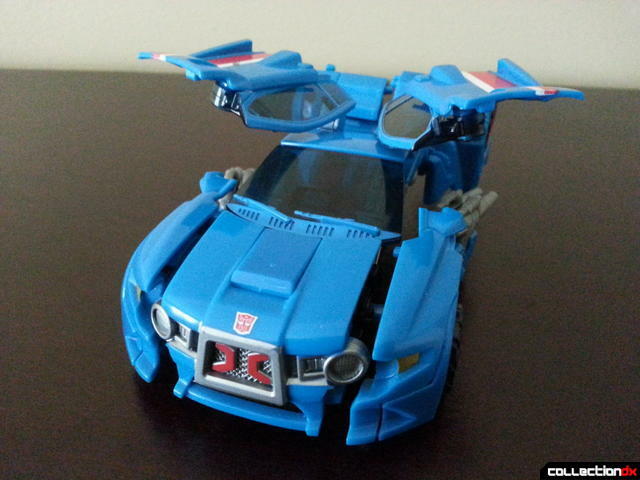 Anyway great review, I am patiently holding off for a Takara release with, fingers crossed, a darker G1 color scheme. I thought I saw some graffiti on your desk, yeah some really tiny graffiti..
"James Roberts is a well rounded and utterly sadistic writer who uses witty dialogue, name drops and subplots to hurt people." but it was just a speck of dirt. I have certainly read a few comments by fans who feel hurt by him. Which in my opinion is misunderstanding of intent. Were the hips on backwards on your figure? Also, my figure doesn't have the serial number problem.